If you are constantly working overtime, desk-bound, hunched over your computer and endless paperwork, you are well advised to consider using an ergonomic kneeling chair. This innovative chair can help you with maintaining a good sitting posture, better spine health, reducing aches and pains, thereby enhancing alertness and increased productivity. You’ll leave at the end of the day feeling better and lose the pains associated with traditional chairs. The chairs have a seat pan that tilts slightly forward to ensure that the spine is totally aligned from the neck, back to the end of the spine. And when you sit on it, your body weight is redistributed to your knees, shins, and pelvis, thereby reducing the strain on lower back muscles. In fact, an original kneeling chair enables you to choose from among a variety of seating positions which promote good sitting posture and allows good blood circulation. The chair is designed for the purpose of reducing strain and stress which traditionally accumulates around the lumbar region. Chiropractors around the world tend to urge patients to use the kneeling chair instead of the conventional work chair. The forward slant of the tilted seat pan and knee cushion actually helps not only to align the spine but also ensure that your pelvis is balanced. When you start using this type of chair, you will almost immediately feel the benefits of the kneel chair the moment you take your seat. 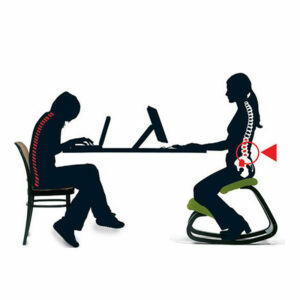 Once you get used to this novel method of sitting on your ergonomic kneeling chair, you will not only be on the road to good spine health, and but also at the same time, saving on medical bills arising from back pains and other back ailments. The kneeling chair is available in different sizes to accommodate persons of different body frames. The chairs have a manual height and knee adjustment feature to make it easy to adjust to anyone’s body size. Some ergonomic kneeling chairs include a back cushion and handles along the sides of the seat to make it easier to get in and out of the chair. Some people prefer the chair with a back because it is a bit hard getting used to a chair with no back to lean on. Most people find the knee chair very comfortable and easy to use. Another benefit that makes the chair so popular is that it can fold up neatly and is easy to transport. The ergonomic kneeling chair is practical for home or office use. An ergonomic kneeling chair can be used by people of all ages, young and old. The chair instills good posture in younger people and teenagers and helps increase back strength and prevents poor posture while alleviating possible back problems in the future. Many of us tend to spend long periods of time at our workstations or stay up late night playing computer games. Most often than not, we sit at the workstation in a slouch position. The eventual effect of such a lifestyle is bad posture as well as backaches, tired neck and shoulders, and muscle aches. Keep this lifestyle for a year or more and you might just have damaged your backs by overworking your spine, causing permanent damage to your spine health. The answer to your problem is the ergonomic kneeling chair which is amongst the most effective of all ergonomic desk chairs. Slip into an ergonomic kneeling chair and you will start feeling the difference of it as compared to the conventional office chair. It literally allows you not only an ache and pain-free work day every day, but you can also start keeping a good sitting posture almost effortlessly. This type of chair will reduce the strain by ensuring you sit in a manner that takes pressure off your lower back thereby reducing the level of discomfort and pain you will feel. But there is a lot more to reducing back pain than this alone. You need to nourish your spine whilst sitting by being able to move freely in your chair, especially when you are sitting still for extended periods. Achieving this is made simple by distributing your weight forward in your sitting position. You reduce the pressure on your lower back and share it between your thighs, knees and lower legs. Being able to adjust your seating position can have a dramatic effect on the pain levels you will and probably already feel. The third benefit of using an ergonomic kneeling chair is obviously the reduction or elimination of pain in your back from sitting for extended periods of time. With your weight properly distributed and the improvement in your posture, this greatly assists in pain reduction. Some people have noticed an improvement within minutes of sitting in a properly designed Ergonomic Chair. As I am a writer I find that I no longer end up with back pain when I get carried away with writing an article and forget to take breaks and stretch. Many writers report that this has been the best tools to aid in writing that they have ever purchased. The second benefit is to your overall posture. It is almost impossible to sit incorrectly in your Kneeling Chair. These chairs are designed to ensure your posture is greatly improved which has the added effect of strengthening your lower back as well as reducing pain. If you can get a chair that also has some gently rocking movements then your improved posture combined with the gentle movements allowed all assist in allowing your spine to move and thereby feeding the discs in your spine. While these type of chairs are known to help with eliminating lower back problems, they also tend to cause distress in other areas, especially the legs. This issue is easily avoidable if the chair is well fitted and aligned with the user. However, discomfort arises in situations where the knees are resting on the forward support pad, instead of the shins. From a practical viewpoint, ergonometric kneelings chairs are usually deemed more inconvenient and awkward as opposed to other models of ergonomic chairs. For one, they tend to be tough to get into and out of due to the tight spacing between the support pad and the angled seat. This makes covering a large worktable almost impossible. Ergonometric kneelings chairs are ideally beneficial if used for relatively short time periods. Using this kind of chairs for an extended period may lead to more discomfort and fatigue than your previous chair did. As a result of inactive work routines, people are finding themselves afflicted with back and neck pains along with other similar issues. In fact, arthritis has become quite common as well. That is why ergonomic kneeling chairs appear to have been designed in order to allow people to lessen the damage that they impart upon themselves by sitting for extended periods of time every single day. Good ergonomic kneeling chairs come in all sorts of shapes and sizes as well as in different price brackets. Whatever your budget is, please ensure you do your homework by reading about the posture chair of your choosing before you rush out to cure the pain you are feeling in your back. While it may be tempting to purchase a cheap kneeling chair or even an expensive chair filled with promises of fixing everything, just make sure you are getting value for money and a good warranty. Prior to buying anything, you’ll want to conduct some analysis and the case is no different when applied to the process of purchasing furniture. However, ergonomic kneeling chairs tend to be relatively expensive. Therefore, it is important to know the attributes that you should be looking for? Below are tips to help you pick the right ergonomic kneeling chairs for your needs. To start with, seat yourself in the chair that you’re analyzing and get a feel for it. You will have to look at several different brands as a way to choose which one suits you. Remember the fact that expensive items are not always the very best items. If you’re a first timer then it is best for you to go for reasonably priced furniture since an expensive chair will possess features that you will not be able to appreciate because you’ve never used ergonomic kneeling office chairs before. A weight limit of the chair is also another key factor. Unless you are sure that nobody else will be utilizing your chair, you should make sure that it can support a variety of people with different body masses. On the other hand, take into account the fact that an ergonomic kneeling stool is entirely distinct from the traditional chair. This second option provides comfortable back support which the former doesn’t provide at all. Modern furniture for your office or workplace must be furnished with adjustable portions that may be modified in order to fit your seating preferences. The more adjustable a chair is, the more expensive it will probably be. Adjustable chairs are perfect for the office because anybody can sit on them and manage a comfortable position. This is actually the real reason behind the popularity of ergonomic kneeling chairs. The very last thing to do is to check for proper certification of the brand that you are thinking of purchasing by reputable authorities such as the American National Standards Association or BIFMA. Ergonomic kneeling chairs can be bought in local stores or through online companies that specialize in ergonomic office seating. The models with extra features such as the back and side handles are also higher in price. These accommodations may be worth the few extra dollars depending upon your need or level of comfort that you prefer, though the price is not necessarily a determination of quality. Some prices are based upon the style or additional features of the particular chair. Choose wisely. A kneeling stool is a simple and cheap model that mostly comprises of a wooden frame, two basic pads and in some cases, wheels at the corners. This model is a perfect choice due to its simplicity and effectiveness. The Executive kneeling chairs have a quality frame made from high end polished wood or steel. This model comes with memory foam pads for support (during long working hours) which are covered in leather. It combines a sleek appearance with comfort and convenience. As such, its an ideal addition to your office setting. The deluxe kneeling chair is ideal if you want a premium quality, Comfort-oriented, high-end chair. The deluxe model has a manually adjustable height, knee pads, lumbar support, and basically anything else you could wish for in a chair, including a backrest and wheels for increased portability. Single padded kneeling chairs combines affordability and simplicity in their design. They are mostly made of wood and come with a seat cushion plus a cushion for the legs. This model also has also wheels for quick and easy movement/relocation. Double-padded chairs are designed with a unique foam that eases pressure points. They have two pads, one for each leg, separated by an open space. This design helps keep your legs at a comfortable angle. Other models of ergonomic kneeling chairs include saddle kneeling chairs which have more or less the same features as the previous models. 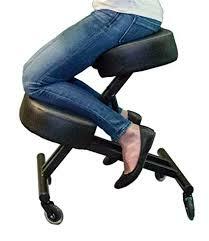 If you are constantly working overtime desk-bound, hunched over your computer and endless paperwork, you are well advised to consider using the ergonomic kneeling chair. The key reason is that the can enhancing alertness and productivity. The ergonomic kneeling chair is a good solid investment in your future health as well as for your current comfort and wellbeing. So if you care about your health and sit for prolonged periods especially while working, why not get hold of an ergonomic kneeling chair to help improve your posture and avoid potential future back problems.